Friday The 13th. | Let's Live Forever! By evening Frank and I were exhausted. We were standing there collapsed in each other’s arms, barely able to move. The plumber did get things flowing enough for us to feel our plans would not be threatened, but we had been doing all that cleaning you put off till the last minute, and combined with the stress of the plumbing dilemmas (and extra not-so-pleasant cleaning), we wanted to fall into bed early. But we had to go out because Frank had a sound mixing gig he couldn’t get out of. And it was FANTASTIC! There were three acts, and they were all boys still at school. Kids that age aren’t allowed in pubs without their parents, so the place was full of both teenagers and their parents. The quality of talent was amazing. First up was a singer-songwriter, followed by two bands. About half the people there were musicians. 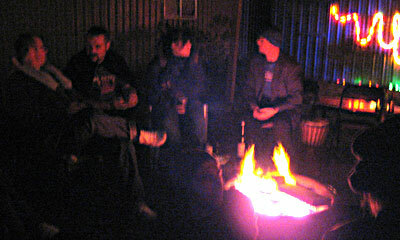 There were some guitars and other instruments seeing some action around the fire, and the piano inside got a workout. It was different, because at our other fires we just had iTunes playing most of the time. This time they kept wanting it turned off so they could play! 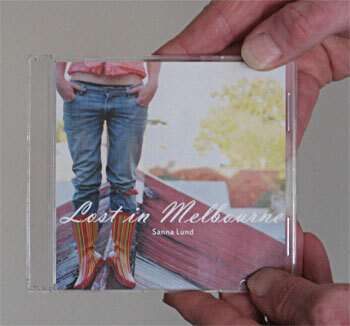 One really exciting thing for us was getting hold of a CD Frank recently recorded. It’s the second CD he has done where the artist went off and got it duplicated to sell it. The artist’s name is Sanna Lund, and she dropped into the party for a while to give us a copy. She is a traveller from Sweden who came into our lives via the open mic night Frank and I run on Tuesdays. 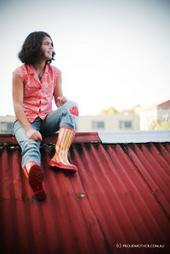 She is a wonderful singer-songwriter with a fantastic voice. The last people left at about 6.30 am—Mike was too sloshed to ride his bicycle so he fell into our spare bed. I guess we must have put the carpet and chairs away and cleaned up the mess, because it’s all gone now—I don’t really remember. I do remember staggering down the street for pizza like we always do on Sunday nights. Well it’s my birthday today! Fifty-five years old! Oh how we Geminis like to chat about our birthdays. Frank and I are going down the street to the Indian restaurant for tea—at the moment I’m just enjoying writing this and not doing much else. I just want to say thanks to my new blogosphere friends—when I began this blogging adventure 3 months ago I didn’t anticipate the feeling of community that has come with it. Glad the plumbing was fixed and that the party went well. And Happy Birthday!!!!! Looking forward to many more as we embark on our blogging journey together! Happy Birthday! Sounds like a great party. “when I began this blogging adventure 3 months ago I didn’t anticipate the feeling of community that has come with it.” Me too. What a wonderful bonus, isn’t it? Vereds last blog post..Best Shot Monday: Would You Put THIS In Your Front Yard? Happy birthday! I hope it was a celebration of love and life. Thanks for sharing your wonderful party with us. Blogging is great, isn’t it? We never know who we will meet, or where they’ll be from. Reading your post reminded me that your seasons are the reverse of ours. @Chris – Thanks!! – we’re hoping the pipes hold out for a while – we are putting it in the “too hard basket” for the moment. @Vered – Thanks and yes – it’s a great bonus. @Mark – thanks – it’s lovely to hear from you again. @Barbara – thanks – yep – it’s well and truly winter here. Happy belated birthday, Robin! That party around the fire with everyone playing instruments sounds great. Good luck with your plumbing. Happy birthday! You’re a beautiful person with a great soul. It’s been my pleasure to know you. You’re correct about the community on-line. It’s amazing experience for me for last 4 months as well. Cheers! @Helen – Thanks! – and that’s what I kept telling myself – as the plumber looked more and more worried! @Marelisa – thanks for your good wishes – we made need it! @Shilpan – thanks – and it has been a pleasure to know you too!